The Homeless Youth Capacity Building Project is a project of the John Burton Foundation that seeks to reduce youth homelessness among economically vulnerable transition age youth, ages 16-24 in California by strengthening the capacity of nonprofit and faith-based providers serving homeless youth. Phase I of the Homeless Youth Capacity Building Project (the Project), a partnership between the John Burton Foundation and the California Coalition for Youth was funded by the American Recovery and Reinvestment Act of 2009 (ARRA) and spanned from October of 2009 through September of 2011. In these two years, the Project offered in-person training, technical assistance in selective areas, web seminars and other web-based resources to hundreds of organizations across California; and provided unlimited, tailored one-to-one technical assistance and financial assistance to over 45 organizations across 7 counties to help build the organizations’ capacities. The Project also convened participating organizations to advocate for better local, state, and federal policies. 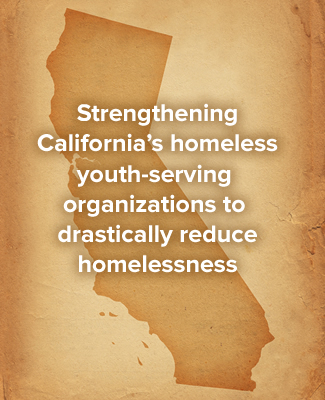 To learn more about Phase I of the Homeless Youth Capacity Building Project, visit Project Accomplishments. Phase II of the Homeless Youth Capacity Building Project is funded by the Corporation for National and Community Service, the Ahmanson Foundation, California Wellness Foundation, S.H. Cowell Foundation, Morris Stulsaft Foundation, and the Walter S. Johnson Foundation; and will continue through 2013. In 2012-13 the Homeless Youth Capacity Building Project is offering a Performance Management Training Series, which will be available to a cohort of 10-12 small to medium sized organizations each year. The Training Series consists of technical assistance and extended training in performance management to provide knowledge and hands on support to enable smaller direct service organizations in seven select counties to strengthen direct service programs. Learn more about the Performance Management Training Series here. For the duration of the Project, topical trainings, technical assistance in selective areas, policy and funding announcements, educational web seminars and other web-based tools and resources will continue to be available to interested organizations.